17 years later to the day, the Vancouver Canucks are heading back to the NHL Stanley Cup finals. As Western Conference champions, they are just four wins away from their first ever league championship in club history in this, their 40th anniversary year. 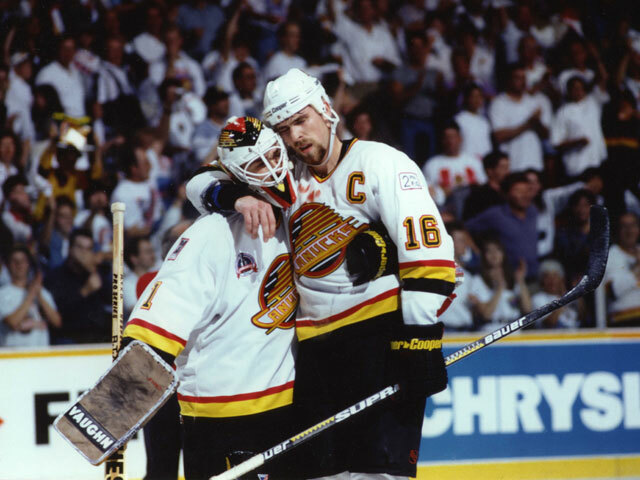 The symmetry and parallels to the improbable 1994 cup run with former captain Trevor Linden are undeniable. Besides advancing to the finals on the same day on May 24 in 1994, both teams came back to win it and clinch in double overtime of Game 5. This time around heading into the finals, they are not the underdogs as the President's Trophy winner during the regular season. And this year, the end result will be different. Round 1: Chicago Blackhawks in 7. Round 2: Nashville Predators in 6. Round 3: San Jose Sharks in 5. Round 4: Boston Bruins in ? I have chills thinking about it. In 1976, Montreal hosted the Summer Olympics. In the next NHL season (1976-77), the Canadiens won the President's Trophy and the Stanley Cup. In 1988, Calgary hosted the Winter Olympics. In the next NHL season (1988-89), the Flames won the President's Trophy and the Stanley Cup. "I'll play on one leg. I don't care. [...] I gotta do it for them." This is the third ever Stanley Cup final appearance in team history.